Watching the video on their KickStarter page and seeing the SkyProwler in action leaves a strong impression. It starts out as a quadcopter during take-off and landing, then once in the air (should you wish), you can retract the landing gear and propellers to transform into an airplane for higher speeds and efficiency. Vertical Take-Off and Landing (VTOL) enables aircraft to operate from virtually any environment. No runway is required. This opens up flying to a much larger range of possible terrains, from backyards and rough fields, over snow-covered mountains and sandy beaches, to a boat on the sea. The problem with traditional VTOL machines such as helicopters and more recently multirotors is that they are slow and inefficient. This is because such machines always have to actively work to stay in the air, in addition to pushing themselves forward. Also, large rotors standing in the oncoming wind of a moving aircraft are very detrimental to aerodynamics and hence speed, endurance and range. Winged aircraft like airplanes on the other hand are far more aerodynamic and they get their lift almost ‘for free’ from their wings. 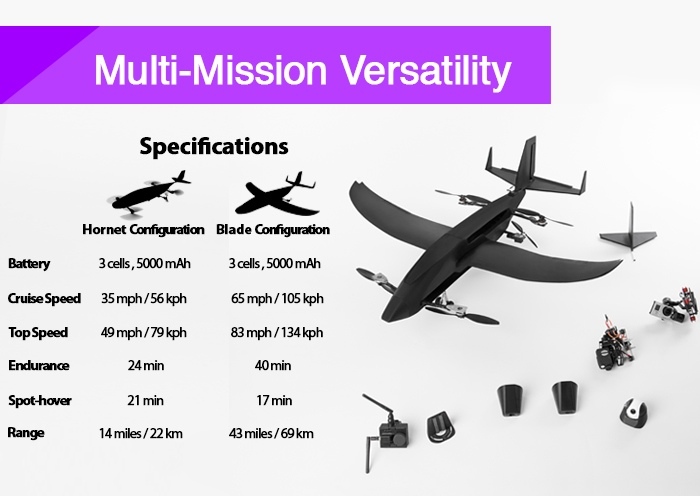 Winged aircraft can typically fly twice as fast as rotorcraft, stay in the air twice as long and have a range that can reach 4 times that of rotorcraft on the same amount of fuel/energy. Winged air travel can be just as energy efficient as travel by car, but it is up to 8 times faster! The amount of engineering going into this quadcopter hybrid is raising the bar for the industry. We can expect more new, innovative companies to enter the hobby aircraft arena so it’s an exciting time to be flying drones! Krossblade expects to ship July of 2015. If you’re looking for something to practice on in the mean time, check out our guide to the best beginner quadracopters.